"A Spring Bouquet!" - Sunday, April 7, 2019. Photo credit: Bill Mullane. 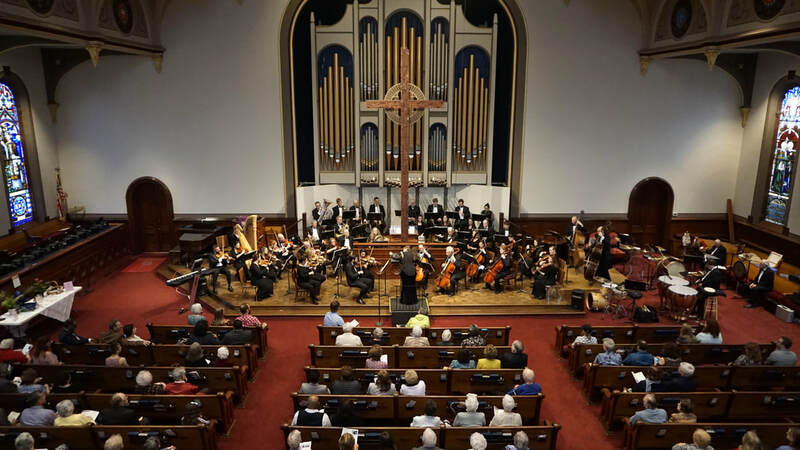 The Warren Philharmonic Orchestra's 54th season features two public concerts on Sunday, October 6, 2019, and Sunday, April 19, 2020, both at First Presbyterian Church, 256 Mahoning Avenue, NW, Warren. Concerts begin at 3 p.m. Season subscriptions are now on sale. View this season's brochure. [PDF 2 pages] Or, tickets for the each concert can be purchased at the door. Adults: $25; students: $15; children under 12 are free with an adult​. The Orchestra's 50 musicians with 65 different instruments have won raves for their superb performances, stellar musicianship and captivating programs of compositions from the 1600s to pieces just composed. Susan Davenny Wyner is musical director and conductor. She has received international acclaim for two careers. As a lyric soprano, she performed at the Metropolitan Opera and won a Grammy and Grand Prix du Disc. As a conductor, Davenny Wyner has been called "electrifying, powerfully compelling and emotionally fearless" the The New York Times, a "rousing and joyous" leader by the Chicago Tribune, "terrific" by Opera News Online, and praised for her "vibrant conducting and buoyant, sensitive baton" by the Boston Globe, which also dubbed her "the best program maker in town!" Read her full biography. Full orchestra school concert with individual instrument demonstrations to be held October 4. Art in Music Contest, where Trumbull County students in grades 3 through 8 are invited to create art about the orchestra's instruments and its music. ﻿Strings of Joy program, where selected Trumbull County students in grades 3 through 7 are eligible for free violin lessons.